Waiting for SSC MTS results? Here we share the link to examination results of SSC MTS Madhya Pradesh region(MPR). The Madhya Pradesh region has 536 post vacancies altogether. MPR region comprises of states Madhya Pradesh and Chattisgarh. Madhya Pradesh state has 464 vacancies and Chattisgarh has 72 vacancies. There will be congestion on the official website due to massive volume traffic on the result publishing date. We are sharing the result link so that you can easily access the results. Just bookmark this page or bookmark this site to get updated information regarding the publication of results of MPR region. Once you get your scored marks, then check with the cut-off marks to know whether you are qualified for the second phase of the SSC MTS examination. 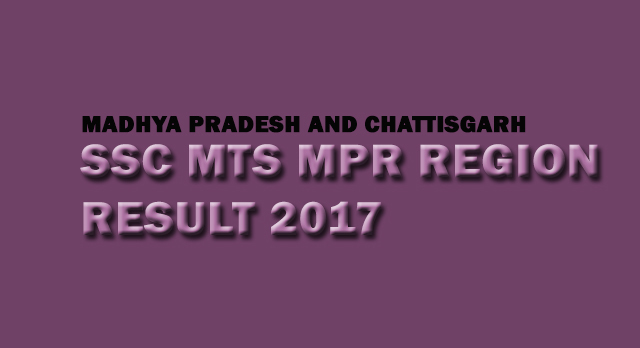 How to check the SSC MTS Madhya Pradesh Region (MPR) results in 2017? Here is a complete guide to check MPR result online. * Make sure you know your registration number. if not check your admit card for getting the registration number. * Once you have your registration number, go online and find the official SSC site of Madhya Pradesh Region (sscmpr.org). * Enter the registration number of yours in the empty box. Obtain a hard copy of the result by taking a printout of the results. If anyone has any queries or doubts regarding the published results, you can contact the regional director of Madya Pradesh Region. Compare your scores with the cut-off marks of MPR region.The cut off marks are decided separately for each region. The cut-off marks decided for Kerala Karnataka Region will not be the cut-off score for Madhya Pradesh Region. Cut-offs mark is chosen on the basis of total vacancies of one region and number of candidates passed in the examination. Only if you have scored above or at least the cut-off marks, then only you are eligible for paper 2 of SSC MTS examinations. The Paper 2 examinations will be held in the August month of 2017. There is not much to fear for paper 2 exam as you need only qualifying marks in paper 2. Once you have qualified in the paper 2 also, then you will be called for document verification. Only after document verification is over, a final list of candidates is published.